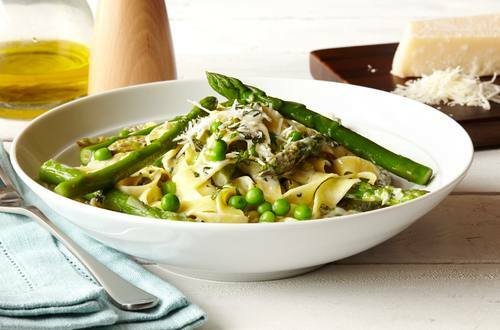 The perfect pasta primavera. An enticing medley of pasta and fresh vegetables in rich Parmesan sauce made creamy and tasty with Hellmann's® or Best Foods® Real Mayonnaise. 1 Combine Hellmann's® or Best Foods® Real Mayonnaise, lemon juice and heavy cream in measuring cup or small bowl; set aside. 2 Heat olive oil in large nonstick skillet over medium heat and cook garlic 2 minutes (do not brown). Stir in asparagus and peas and cook 2 minutes. Add hot cooked fettuccine, 3 Tbsp. pasta water, Mayonnaise mixture and 1/4 cup Parmesan cheese. Toss and heat through. Sprinkle with remaining 1/4 cup Parmesan and garnish, if desired, with chopped parsley and/or mint.